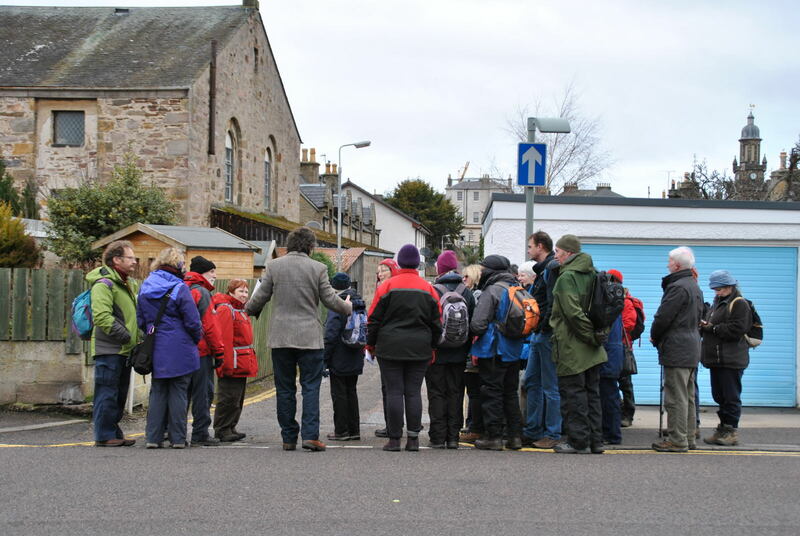 Forres folk are suspicious of strangers – and especially suspicious of foreign strangers who pretend to know something about Forres history. And I should know. Having worked as an archivist in the royal burgh for barely thirty years, and lacking at least three Forresian grandparents, I am still a couple of generations short of qualifying as any kind of expert on Forres history. And Forres is suspicious of people from the North. Long local memories recall a time when Moray held the front line against the Vikings; and longer memories of local independence are now reinforced by academic research that places Pictish Fortriu in Moray (or Moray in Fortriu) – the Pictish kingdom persisting as the heartland of the Cenel Loarn branch of the Dalriadan Scots. 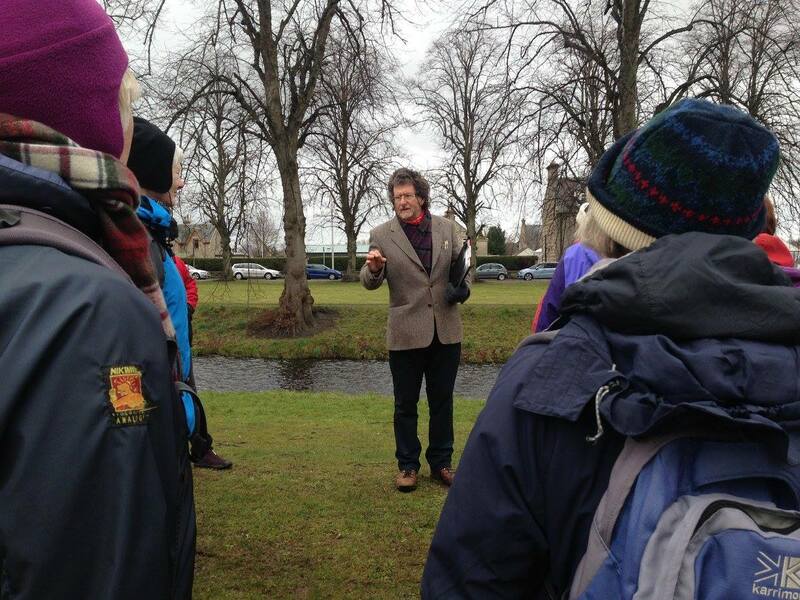 But, despite this history (and also because of it) I rashly accept an invitation to guide NOSAS around the royal burgh. We choose a day of icy wind and leaden skies. We gather in a draughty car park for the prelims (safety check, head count, toilet break). And then there are the necessary explanations: this will be a walk in feet and inches – a concession to my age, and also because (notwithstanding modern archaeological practice) the place was built to an older yardstick. We note the regular snaking roods[i] of burgh biggid land that curve sinuously from high street frontage to head dyke (at the foot of the feu) with back passage beyond. The linked head-dykes formed a continuous wall to define (if not effectively defend) the liberties of the burgh. Beyond extended unfenced commonfield arable, with pasture and peatbog to support the burgh community. On the north side the burgh was originally defined by the Mosset Burn. And even after the Burn abandoned its medieval course, cautious burgh notaries conservatively continued to draft sasines by reiterating the descriptions contained in older deeds – defining feus by the old run of the river. This entry was posted in General Archaeology, Medieval, Moray, Pictish and tagged burgesses of Forres, Cenel Loarn, Cluny Hill, David I, feu, Forres history, head dyke, house of Canmore, King Donald son of Constantine, King Dubh, King's causey, Macbeth Moray, Maelrubha of Applecross, Malcolm I, medieval burghs, medieval Forres, medieval motte, men of Moray, mephitic gas and offensive effluvia, mercat cross, Moray archaeology, Mormaer of Moray, Osbern Pentecost, pictish standing stone, port of Findhorn, royal burghs, St Laurence parish kirk, Sueno's Stone on May 1, 2016 by nosas.